Lilly turns to her good friend and neighbor, Armina, to help keep things in order—until a mysterious chain of events leaves Armina bedridden and an abandoned baby on her doorstep. Lilly works to uncover the truth, unaware of what a mess she’s found herself in until a break-in at her clinic puts her on high alert. As she struggles between what is right and what is safe, Lilly must discover the strength of her resilient country neighbors, her God, and herself. 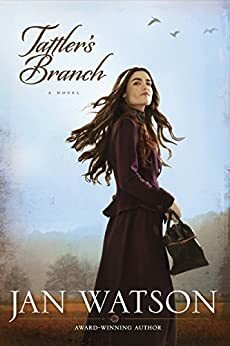 Set in the early 1900's in the hills of Kentucky, Tattler's Branch, captured my attention right away. The descriptions were perfect and made me feel like I had stepped back into that coal mining community long ago. Back when neighbors leaned on each other and God for help. I felt and understood all the characters but Lilly and Armina were two I would love to talk to! They both cared about others and were down to earth. My kind of people. Lilly stood out the most to me though because she was a woman doctor at a time when it was unheard of. She was brave but yet she missed her husband terribly. I love the letters she exchanged with her Mom asking her for advice. Tattler's Branch had history, mystery, and romance all rolled into one making it a wonderful read! I received this book free from Tyndale Rewards with my points. I was not required to write a positive review. All opinions expressed here are my own.